Simplify Your Independent School Fixed Assets Accounting and Management with Fixed Assets. Fixed assets require special processes for accounting and management. You need to record new assets at the time of acquisition, calculate depreciation, and record disposals, sales and retirements. For some assets, you may need to track warranty and service information. You also need to create a variety reports to summarize assets by category, project future depreciation, and provide end-of-year documentation such as Form 990. And you want your fixed assets management software to integrate with your accounts payable and general ledger systems, to track asset values, post depreciation, and minimize data entry. Learn more about our Ascendance Business Office module and its add-ons by downloading the product sheet. ✓ Define unlimited asset classifications such as land, building, equipment, vehicle, etc. for summary reporting. ✓ Integrates with Accounts Payable to create new asset records directly from vendor invoices (subject to review and approval). ✓ Record extensive asset details where needed, including dates, serial numbers, purchase data, location, even a photo. ✓ Record warranty data and even set up maintenance schedules with automatic reminders. ✓ Use any of several standard depreciation methods, or create your own. ✓ Depreciate monthly, quarterly, or annually, and post directly to General Ledger after review. ✓ Disposal wizard walks you through the steps to remove assets via retirement, sale, or exchange. ✓ Flexible reporting to summarize and track asset values, depreciation, and other details. ✓ Add Dashboard for Business Office to get graphical analysis and up-to-the-minute reporting. Interested in seeing Ascendance in action? 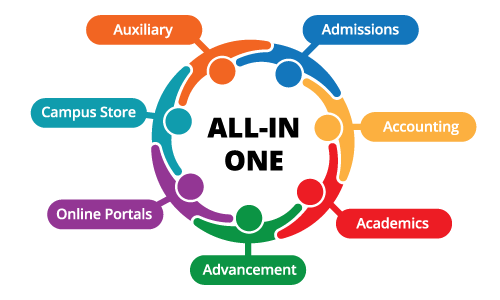 Click here to schedule a demo with a school solution expert!